While there are no protesters chanting in the streets to demand that the American Hospital Association do something about the staggering number of patients who are killed by medical mistakes every year, the question might be: why not? For all of the inaugural talk of American carnage, the real killing grounds are not in the blighted innner cities, but in the 5,564 hospitals across the country. 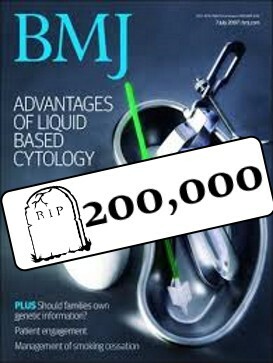 Just what the body count may be has been the subject of a battle that has been playing out in medical journals and patient safety conferences for the past three years. It all started with a 2013 paper by John James, PhD., which suggested that a whole lot of people are dying because of faulty or negligent care in American hospitals. What was fostered instead was mostly a collective shrug from the medical establishment, loathe to credit such an outrageous claim from the ranks of the patient safety movement. James’ hopes for an outcry were partly fulfilled when Johns Hopkins Dr. Martin Makary published a paper along the same lines in the prestigious British Medical Journal, claiming that more 200,000 patients were dying every year — which means that one out of 10 Americans leave the hospital feet first because of a preventable error, making it the third leading cause of preventable death in America. The outcry, however, came not from people in the streets, suddenly aware of the dicey chances of surviving a visit to the local infirmary, but from institutional patient safety advocates — not the grassroots types who are radicalized by the unecessary death of a loved one — but the professional advocates; doctors and others who make their living by working with and within the system. 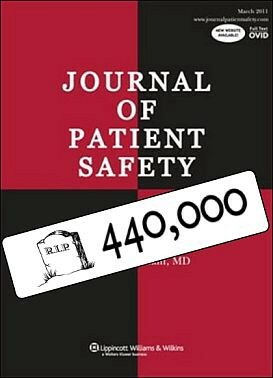 Dr. Kaveh Shojania, editor-in-chief at BMJ Quality & Safety, wrote a paper scoffing at the high numbers of both Makary and James, positing that the annual death toll from preventable medical errors was more like 25,000. In the medical journals, there are letters-to-the-editor, responses and rebuttals, a picking apart of data and critiques of methodology. The debate over just how many people suffer and die every year because of negligence and preventable medical error rages on, and it will continue to do so because of the subjective nature of the data. Physician and patient safety advocate Kevin Kavanagh recently published an overview in the Journal of Patient Safety in which he compares all the viewpoints and reviews all the data. He and his colleagues arrive at a figure of 163,000 annual unecessary deaths, but that is almost an aside in his piece. More to the point is that whether it’s 100,00 people every year, or 1,000 people every day, it is clear that the scale of the problem is enormous, and bickering over the numbers doesn’t help one bit.